From Theresa Bergeron to Thermohair Inc. I was born and raised in Cornwall Ontario, attended French catholic schools and convents. From there I obtained my BA in Life Sciences at Queens and MSc in Nutrition at University of Guelph. A few over the years have asked me why I had wasted all this education just to raise goats and make socks. Education is never wasted and people should “enjoy” their work no matter what it is. I have never regretted my post graduate studies. Those years taught me the discipline and techniques to overcome hurdles and solve problems, skills that I still require today to get socks to market from the sheared fleece to finished product. In February 1983 I bought my first 4 Angora goats. I had read an article in the local newspaper about these mohair producing animals, and having an interest in hand spinning, decided to buy some. This particular breed of goat is relatively rare compared to the dairy breeds, but by coincidence one of the graduate students I was working with at Guelph University had a small herd. Little did I know then that I would end up on the international mohair scene. In the 80's I was content raising these pretty practical goats, selling the greasy mohair to local spinners, and selling breeding stock locally as well as overseas. But in 1989 the price of mohair fell drastically to 50 cents/lb and I wasn't about to give my hair away. I decided to make a finished product...something simple...bed blankets. The Bay blankets in stores sold for very high prices and were only made of wool. After lots of leg work, mileage and phone calls, I found a commercial spinner to make the yarn and an old mill to weave the blankets. The queen size 6 1/2 lb blankets were 75% mohair, 25% wool, and were really warm and luxurious...but by this time we were in mid 1990 in a recession. No one was keen on spending $200 on a blanket. It was a bargain at that price, with the Bay blanket selling at $350...but I was an unknown. I wasn't about to give up. I had raised the animals, and knew the properties of the hair: strong, warm, soft...great for feet! I didn't want to get involved in fashion trends, and colours of garments, but socks should be simple. It was far from simple! Every step of development had its hurdles. Who could scour the hair commercially? Years ago farmers brought their wool to the local yarn factory, where it was washed, carded, and spun. Now there were very few mills left and they bought their fibre ready to spin. To make it more challenging, these same few mills dealt with wool and synthetics, not mohair, which is a fibre with its own idiosyncrasies. The factory that had made the yarn for the blankets could not do it for socks, because I needed a worsted system that could make a fine, even yarn. Through much research I found a mill in La Beauce that would scour the hair. Then I found a place to card the hair, turning it into slivers ready for spinning...but who could spin mohair in Canada? I obtained a list of Canadian textile industries and started phoning. It is not an easy task to phone large companies and ask them to help you when you are unknown and small. I had the fortune to contact a very nice elderly European man who owned a spinning mill in Toronto. When I first called him, I did not realize that he owned such a big company, which is a good thing, because I probably would have been intimidated. I asked the switchboard operator for him by name. I asked him if he could spin mohair. Yes he could. He had learned in France many years ago. He asked what company I represented to which I replied "It's just me"...and He "what is it that you do?" "I raise the goats" I think I caught his curiosity...and I trucked my mohair to his mill in Toronto. He was a very nice man with lots of advice. He stood by the truck and put his fingers through my mohair noting that it was exquisite quality. He asked what the yarn was intended for but I didn't want anyone to steal my idea. But he needed to know the end use to decide how to spin it. Still today I have much respect for him and the effort he put into helping me. I still recall the comment he made "Theresa, why do you want to waste this beautiful hair on feet?" He spun the first hair for my socks. The next step was to find a mill to knit. Large hosiery firms were not interested in doing custom orders, never mind dealing with mohair. I finally found a small firm in Acton that would give it a shot. Even here I received the same reaction. "You don't make socks with mohair!" Why not? This is the reply I received. " The hosiery industry is the second lowest on the ladder, just above the rag industry. Mohair is a luxury fibre for garments that can be seen (shown off), headwear, outerwear. It doesn't belong here." The owner handed my 2 cones of yarn to her mechanic and asked him to work on it. That mill has since closed, and the socks are now knit in Toronto. Mohair yarn has amazing strength & actually wears out the steel feeders & knives in the knitting machines. It is truly the "diamond fibre". What makes the yarn so difficult to work with, is also what makes them great socks. The first sample pair was worn every day for 6 months and still held up well. I was so proud that my idea worked! I took the used pair and a new pair to a well established business man and showed him how I had an ideal sock, so warm, so tough. He looked at me straight in the face and said "Do you expect to succeed in business? North American society is a disposable society. You make something to look good, feel good, ...and wear out. Change the blend so they don't last so long." I didn't agree that we were a disposable society. I replied " If I buy a good product that lasts I may not buy several for myself but I will pass the word and buy as gifts for family and friends. There's 25 million people in Canada, and 250 million in the US. If I sell a million pairs of socks, I'm a millionnaire. I'm not changing a thing because this is the perfect sock!" I trademarked the socks in North America in 1992 as Thermohair. I have no regrets doing this, as since then, others are now trying to make mohair socks. I have picked up socks labelled MOHAIR SOCKS and upon checking the contents find only 37% mohair, the remainder being inexpensive synthetics. Thermohair socks are knit with loops of 75% kid mohair yarn. This is the most soft and expensive of the mohair grades. Its micron count is close to cashmere, giving the socks the softness of cashmere, but the strength of mohair. Over the years Canadian manufacturing of most products, especially textiles, has pretty well exited to China.Those factories that scoured, carded and spun my mohair closed. I then had to have yarn made in Bradford England which had been the world hub of the mohair industry since the late 1800’s. In 2003, four mills closed and I was now without a source of yarn. As fate would have it, on talking to a British goat customer from 1986, she referred me to a contact of hers in South Africa. The yarn has since been made in South Africa from US and South African mohair. 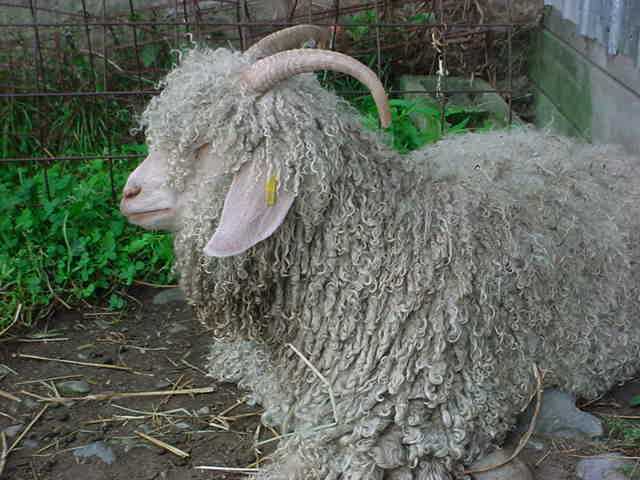 This is the last country where there remains a commercially viable population of Angora goats. The yarn is then knit into socks at one of the few remaining mills in Canada. The socks are sized, sorted, labelled, some dyed, and shipped from the home farm. My own mohair is now used to make the blankets and throws which can still be done in this country. A sad state of our manufacturing sector indeed, which used to be the life of our economy. The consumer who sees a pair of Thermohair socks on the shelf of a store has no idea of all the behind the scene factors. Mohair is a world commodity which depends on world weather patterns, world politics and fashion demands. When there is drought, the goats die. When there is political unrest, the goats are slaughtered. When Clinton removed the subsidy on wool and mohair in the US a few years back, the goats went to the slaughter house by the thousands. 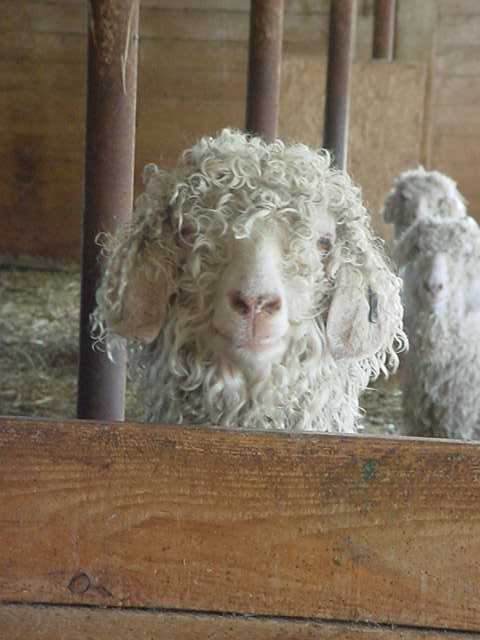 In the early 90's there were 2 million Angora goats in the US. The American Mohair Council estimate for 2017 was 100,000. Mohair supplies are very low, and kid hair is now scarce. In 2017, world mohair production was 5 million KG of which 10% is kid mohair.